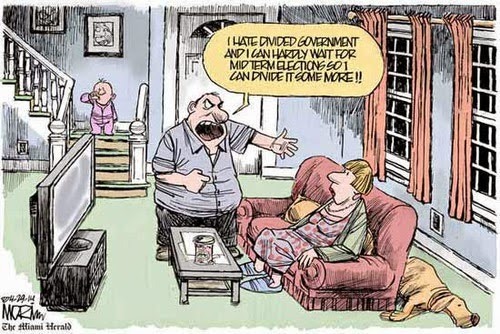 The Dividist Papers: Third in line. "Honest Graft and Dishonest Graft"
This post is about Denny Hastert, Speaker of the House of Representatives, and third in the line of succession to the presidency of the United States. But before we talk about Denny, please consider Mr. George Washington Plunkitt. He is pictured in the center of this photo, dated from about 100 years ago. He was a New York State Senator and part of the notoriously corrupt and powerful Tammany Hall political machine that ran New York City. In 1905 he gave a talk that was serialized in the newspaper, and ultimately compiled into a book. The name of the talk, was "Honest Graft and Dishonest Graft". "My party's in power in the city, and it's goin' to undertake a lot of public improvements. Well, I'm tipped off, say, that they're going to layout a new park at a certain place. I see my opportunity and I take it. I go to that place and I buy up all the land I can in the neighborhood. Then the board of this or that makes its plan public, and there is a rush to get my land, which nobody cared particular for before. Ain't it perfectly honest to charge a good price and make a profit on my investment and foresight? of course, it is. Well, that's honest graft." If my worst enemy was given the job of writin' my epitaph when I'm gone, he couldn't do more than write: "George W. Plunkitt. He Seen His Opportunities, and He Took 'Em." "Most of his money was made through purchasing land, through his connections, he knew would be needed for public projects. He would buy such parcels, then resell them at an inflated price. (This was "Honest Graft". "Dishonest Graft" according to Plunkitt, would be buying land and then using influence to have a project built on it.)" Which brings me back to Denny Hastert. Denny Hastert purchased land near Plano, Illinois in 2002 and 2004 for $2.5 million. In 2005 he earmarked $207 million dollars of your tax dollars to build a highway and interchange that passed within a few miles of his property. Four months after GWB signed the bill into law, Denny Hastert then sold his land for almost $5 million dollars. This is a perfect example of what George Washington Plunkitt called "dishonest graft". The interesting point, is that the 2006 Speaker of the House of the United States of America, the man who is third in line for succession to the presidency of the United States, has engaged in activity that would not meet the moral standards of one of the most corrupt 1906 political participants of the most corrupt political organization in the history of the United States. That is all I really wanted to say. I started working on this video mash-up in response to a phenomena I observed and posted about a few months ago. I was commenting on the growing momentum of a classic Rovian political tactic to make a bogeyman out of Nancy Pelosi to motivate the Republican base for the midterms. I said then that there was an obvious flaw in the strategy, and that flaw was named Denny Hastert. So let me just say right here, right now - "I told you so." You don't have to agree with her politics, to understand that Nancy Pelosi is a better choice for "Third in Line", than Denny Hastert. A shout-out to Alan at Hot Potato Mash, who provided some helpful advice and clips. He's got some great political vids on his blog. Check it out. UPDATE: October 24, 2006 The House Ethics committee investigation into the Foley converup continues, but will not finish before the midterm election (surprise!). Regardless of whether the panel finds Hastert culpable, or whether Scott Palmer takes a bullet for his boss, voters nationally can act and remove a corrupt politician from the powerful Speaker role, by voting for divided government and a Democratic majority in the House of Representatives on November 7. UPDATE: November 06, 2006 There is just so much corrupt political "smoke" around this guy, that it astounds to me that anyone could vote to send him back to Congress, let alone vote Republicans back into a majority in the House so he can retain the speakership. Presumably in an attempt to keep him from being more of a political football than he is, the various investigations and Republican dissatisfaction with his leadership will be kept under the rug until after the election. My predicition: Even if re-elected, Denny Hastert will not serve out his term, but will be forced to resign in disgrace before the 2008 election. 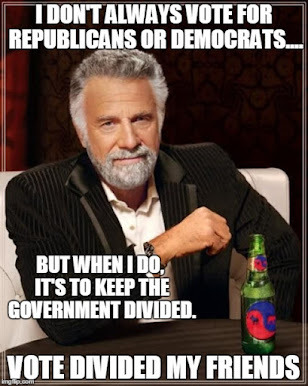 Divided and Balanced.™ Now that is fair. 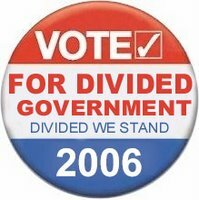 Just Vote Divided. the 2006 Speaker of the House of the United States of America, the man who is third in line for succession to the presidency of the United States, has engaged in activity that would not meet the moral standards of one of the most corrupt 1906 political participants of the most corrupt political organization in the history of the United States. I'm speechless... but then, what else is there to be said?